It’s as simple as a cartoon landscape. The river flows over the the edge of the Niagara escarpment, jagged like a snapped cookie. The water forms a smooth radius like polished jade as it turns from horizontal to vertical. Its a large piece of scenery in constant collapse. Staring into it feels like looking at something in slow motion: freefalling watery shapes blurred by motion, stretched by gravity. The Niagara Falls is an object in the landscape dwarfing human beings – and human beings in vulnerable, soft-shelled tourist form. Temporarily displaced into alien surroundings, with no real connection with where they are, they act out tourist rituals, which attempt to join them with that place. They buy replicas and objects with the name of the place on them to recognise where they are. They photograph and pose to become part of the landscape. There is a quiet hum made up of miniature motors of zoom lenses, sotto voiced arguments about where to eat lunch, the soft rustling of lesiurewear. It’s the sound of tourists in awe. Maybe they are thinking 18th century thoughts as they look through LCD viewfinders: “The passion caused by the great and sublime in nature . . . is Astonishment; and astonishment is that state of the soul, in which all its motions are suspended, with some degree of horror. In this case the mind is so entirely filled with its object, that it cannot entertain any other.’ Which is how Edmund Burke defined the sublime in his 1757 ‘Philosophical Enquiry into the Origin of our Ideas of the Sublime and Beautiful’. I was expecting wilderness at Niagara. I imagined seeing the earth in primal condition. But that’s naive. The idea and image of wilderness is entirely unnatural, invented by philosophers and artists. !9th century landscape paintings might look like untouched authentic landscapes, but actually they are ideas synthesised in pigment on canvas: Concept not countryside. It’s easy to see the Dutch landscape as man made, but really all landscape is invented. It’s cultural meaning is invisibly constructed, and that informs how the land is used. At Niagara, look the right way and your holiday photographs will show your loved ones framed by North American nature. A few degrees left or right and your Kodak memories will be much less romantic. Car Parks, Bus Stations, Hotels, Casinos and Souvenir Shops intrude on the frame. The landscape has been carefully manipulated. Artfully hidden behind some shrubbery is a hydroelectric power station. These are parts of the town that has developed around the waterfall. The raw materials are the rivers potential energy, romance (it’s popular as a honeymoon destination), the relaxation of Canadian gambling legislation, and a border with the USA. A man made cliff grey, smooth, fenestrated and 100% hotel echoes the natural gorge. With all those people in town with a one night stay, there’s hours of tourism to kill after seeing the waterfall. 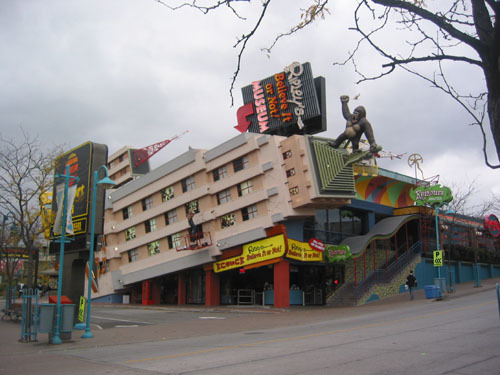 A mini strip has developed, with incongruous theming: ‘Ripleys Believe It Or Not’ housed in a collapsing Empire State building – ripped up sidewalk at the base, King Kong grasping the spike. Opposite, a Haunted House with a giant-sized Frankenstein eating a supersized Wopper. Another neighbouring spooky mansion blends on the right into a drive up 50’s motel, to the left into a Buckminster Fuller-esque futuristic dome. Spiderman and the Green Goblin trade insults over the entrance to Marvel’s Adventure City, like anamatronic statues around the door to a Gothic Cathedral. Niagara is Burke-ian sublime and Dali-ridiculous. Its absurd freakish geology has precipitated an equally absurd and strange town. Like a seaside resort, it’s parasitic urbanism. Jobs, economics, and planning, are built on the ridiculous and frivolous. Social geography suggests urbanism is logical and deterministic. Niagara demonstrates that cities can be patchworked together out of unlikely and inconstant things. As post-industrial towns look to future survival, this kind of ‘absurbanism’ suggests possibilities. Retroactively it explains projects like the Guggenheim Bilbao bringing Manhattan culture to Spanish shipyards, or the Xscape Snow Dome in Castleford (which converted a slag heap into Yorkshires only real snow ski centre). Juxtaposition, imagination, fantasy are the only way of creating realistic futures.